"We are truly one in Christ"
Young people aged between 15 and 35 were particularly invited to take part in this meeting in the Bjørgvin Diocese, and they were the majority of the weekend’s participants, together with one of the brothers and two volunteers from Taizé. In the days before the meeting, they visited schools and churches, as well as taking part in all sorts of meetings, speaking about life at Taizé. The ecumenical committee for the meeting, made up of both Protestants and Catholics, has helped strengthen the community in various parishes in the Bergen area. Entering Bergen Cathedral for the evening prayer on Friday was an exceptional experience. 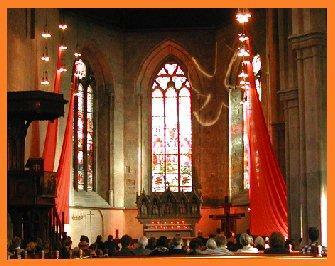 The long, orange cloths hung each side of the church; the icon of the cross from Taizé lit up on the wall; the icon of "Jesus and his friend" – which is the official icon for the Diocesan Youth Year (http://ungibjorgvin.no/) – hanging on the pulpit; and many candles lit in front of the altar. Adding to the atmosphere the choir sang as people gathered in the Cathedral. The brother gave a short Bible introduction on Saturday speaking about the life and faith of Abraham. A seemingly dark future can – as in Abraham’s situation – change to happiness and grow from hope and belief in God. After the Bible introduction we gathered in small groups based on age to talk about our own story of faith in God. After lunch there were several workshops on different themes. During the evening prayer, we all lit candles from the Paschal candle, lighting up the whole church. The Saturday evening finished off at "Oyak", a chance to sit down together informally and have a drink and a chat together, or get out the guitars and have a sing-along. The Sunday afternoon prayer at 2pm marked the ending of the meeting, and that it was time for us to part for now. We head back to our various church communities with the experience of having been gathered in prayer, where our faith in Jesus binds us together as Christians in an community that goes beyond confessional boundaries. Magnus (Norway) was sent from Taizé to take part in these meetings in his own country. We spent one week in Bergen on the west coast of Norway, meeting people of different ages, from different churches and countries and preparing a youth meeting in the cathedral that was to take place at the end of the week. I was quickly impressed by the hospitality shown us: the people opened up their homes for us, who were strangers to most of them. They opened up their hearts for us, and did not hide their desire for reconciliation, or the hardship of being church in a country where so many have lost their interest in it. For me this week was a sign that reconciliation is possible - when it was possible for these people to be open about their differences, but still respect each other and finally, by praying in front of the same God, prove that we truly are one in Christ. Pawel (Poland) completes this account with his own testimony. In Lia Gard, in the mountains next to Koppang, we took part in a gathering of young people, and we tried to speak about what we are do in Taizé, giving a simple testimony, sharing experiences from the common life we lead there. We were also there to encourage young school students to make the journey to Taizé in the summer. 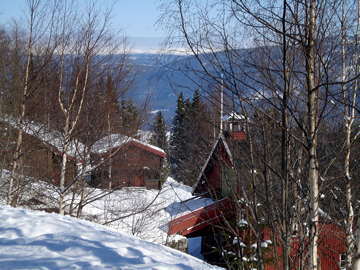 In comparison with other scandinavian countries Taizé is not very well known in Norway. Some of the songs are commonly sung in local churches but most people don’t know their origin. 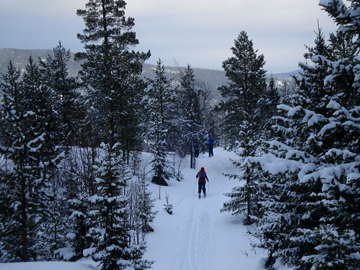 For someone from Poland, going to Norway was like going into the end of the world. I’ve never been so far north, I had the impresion of being lost in the mountains, but this short moment helped me to find silence in myself. I think the most intense experience was the silence around: the silence in the chapel when you could just hear the wind blowing snow from the roof. We were almost 50 people, some of them volunteers staying there for longer, just like us in Taize. Others just come for the weekend from different places in Norway, Sweden or even from the Netherlands. In Norway we met a lot of people who came here to work, migrants who have left their countries looking for work. Immigration is something that the Church in Norway has to face up to. It doesn’t only bring problems but also many new ideas, beautiful things to share through the vitality of faith of these new citizens. During the preparation we spent time at many churches where the people were very open. The pastors were always available to meet the young people, to speak or to listen. The preparation group shared a lot, and we learnt a lot from their example, from their lives and their problems, from our differences and those point where we come together as churches. Nous must hope that that does not only bring people together, but also Churches. We don’t always have the same understanding of everything, but we have the same goal in Jesus Christ. The young people of Bergen continue to pray using the songs of Taizé, each Tuesday in the chapel of the St. Sunniva student hostel, and at St. John’s Church every second Thursday at 7pm. In addition there are prayers with the songs of Taizé organised by the student parish every semester.